Nancy Paulsen Books, 9781524738808, 32pp. From the creator of Goodnight Goon, a laugh-out-loud friendship story that perfectly captures the high and low moments of a typical playdate! Pete couldn't be more thrilled when a monster shows up in his bedroom. Now Pete has someone to play with! And the hungry monster couldn't be more thrilled to be there, either. Now he can . 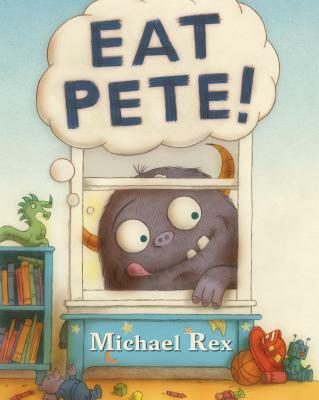 . . EAT PETE! But Pete has other ideas. And they are all good fun and quite distracting--things like playing cars and pirates. Well, we all know the course of playing together nicely never did run smoothly. So how much longer will the monster have to wait before he can . . . EAT PETE? Michael Rex has written and illustrated over twenty children's books, including With Any Luck, I'll Drive a Truck, the New York Times #1 bestseller Goodnight Goon, The Runaway Mummy, Truck Duck, and the Fangbone series. He has a master's degree in visual arts education (K-12) and worked as a New York City art teacher for four years. He visits schools across the country, and has appeared on The Celebrity Apprentice as a guest illustrator. He lives in Leonia, New Jersey, with his wife and their two sons.